I saw this quilt at a quilt show and was interested in making it. It is called a Split Nine Patch. I am a very visual person and really need written instructions. I would like to make one out of scrappy calico prints. I understand the concept of sewing a nine patch square then cutting it once diagonally. Where I am confused is with the light white off white squares and cutting it. I looks like one square in this unit is a dark square. Can anyone help me with better directions? Bonnie Hunter is using Split Nine Patch for the Leader and Ender project this year. 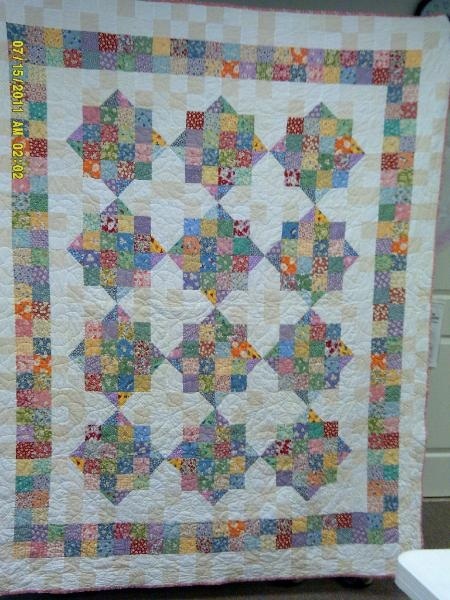 If you go to her site www.quiltville.blogspot.com and click on the free patterns tab at the top, you will find a nice tutorial on that pattern as well as many different way to use that block. 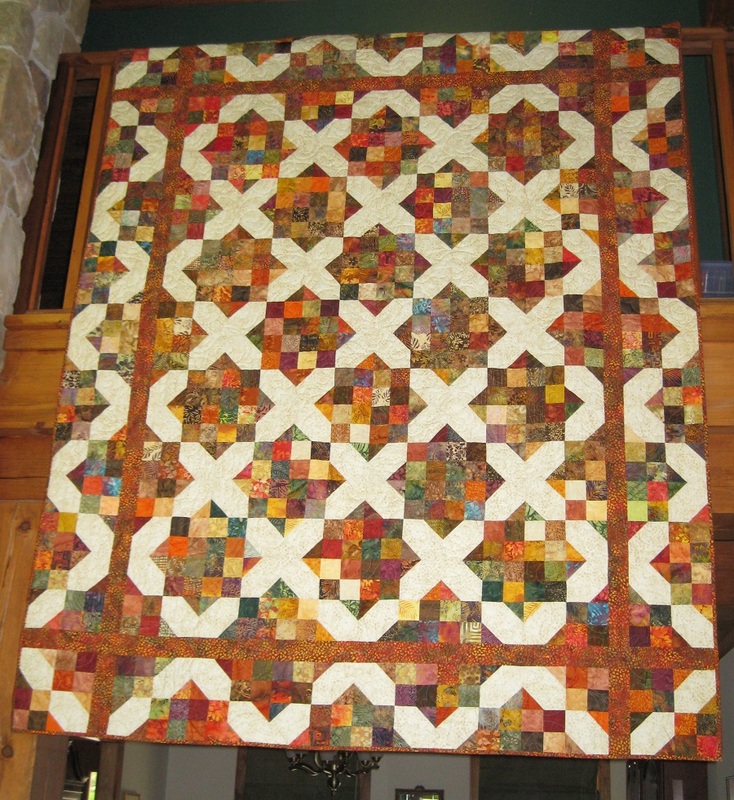 I do not believe that these blocks are sewn and then cut - it is similar to this quilt we made from the book Open a Can of Worms by Debbie Caffery. That being said it looks to me that the block is assembled as in the second image. Last edited by btiny36; 07-25-2013 at 05:32 AM. Wow, I have always liked this pattern...and these are gorgeous. I swear if I made all the quilts I love, I would have to live forever. Cause you know, we all constantly add quilts to our 'want to do' list. I can't imagine why this is called a split 9 patch. It's simply square after square with some squares being made of two triangles. The main block is a very simple 4 x 4 patch with the adjoining blocks containing the HST to make the points. And 4 patch cornerstones. That's what I see too, but I was looking at it as a 4 x4 with squares adn triangles making the sashing. Your pattern is much easier to see. I've made this quilt. I assembled the blocks like eparys suggested. Looking at that block, divide it by 4. That is your 9 patch. The first row is light, light, 1/2 triangle, the second is dark, dark, light, the third is 1/2 triangle,dark, dark. It's a beautiful pattern! Interesting that Missouri says a daughter designed that quilt when it is quilterscache's 'Sunny Days'. So what does the "split" refer to? Very misleading in my opinion. She probably designed the new and easier way of making it, not the pattern. If I were doing it, I too would make 4 - nine patches and then sew them tog randomly. The one we did for guild, we broke down each visible larger block into four smaller ones to get the randomness we wanted. quiltercache designed very very very few of the blocks she claims rights to. Most are older than our greatgrandmas. Now, I won't argue the chance that a certain person lays claim to particular color lay out, but even that is iffy! I know this pattern by another name - scrapaholic. The block is actually 1/4 of the block that everyone is looking at, and it is incredibly flexible. 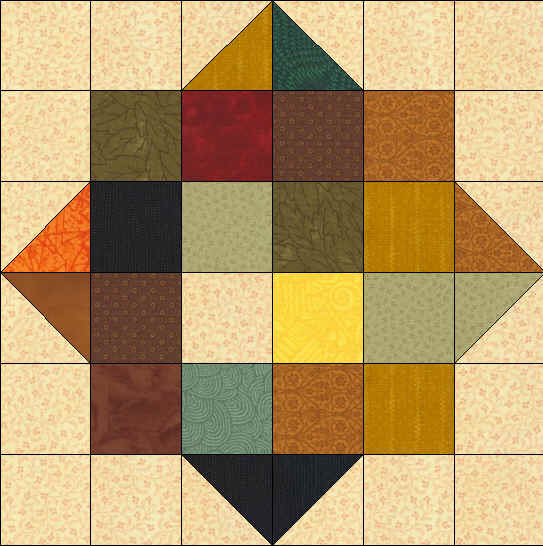 I've posted two quilts made from different settings of this block - http://www.quiltingboard.com/picture...k-t216883.html and http://www.quiltingboard.com/picture...d-t207658.html. The quilt below is the setting shown in Kathy's picture, and the block below that is the block used. As you can see, it's incredibly easy to make, and great for scrappy quilts. I think it's so interesting how we 'see ' different blocks. dunster - your illustration is the easiest one for me to understand. That way would probably be the easiest one to 'build' in scrappy mode. I feel that way about almost all the blocks made with straight lines! I think it's a FREE pattern called chiclets by brandysquiltpatterns... If I knew how to do a link I would. just google it and you should be able to find it. The quilt in eparys' first picture is usually known as Arkansas Crossroads, an old traditional pattern (older than me, at least, and that's saying something!). It's usually assembled with sets of 4-patch and signature blocks. I agree that the block design shown in the second picture is correct for the quilt that started this thread (by whatever name). The main difference is the corner squares are not white in the one from the Caffrey book. As has been pointed out, it's quite versatile. Quiltville's Fourth of July quilt is a variation of this, also. I just made this. I'm pretty sure this is about what you are going for. I like this pattern. One thing I noticed is the variation in the light shades surrounding the main block. I can see anyone of these patterns becoming the original just using variations of a cream color. It is a lovely quilt by any name. Rose - thanks - I could not remember if the Caffery book had a name for it. Another Guild member had the book and for a while, as I was assembling it, I had it at my house. This is our Raffle Quilt this year! Look at #15 on this thread - the top right and bottom left corners are made of HST - so that may be where the term 'split' comes from. Many blocks have several names - and some names have several blocks that go with them.